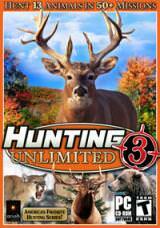 Found one file extension association related to Hunting Unlimited 3 and 1 file format developed specifically for use with Hunting Unlimited 3. Travel throughout the United States, Canada and exotic Zambia to lock your sights on the prey of a lifetime. Unique action-packed missions will get your quarry running and your heart pumping. Track the quarry of your choice- White-tailed Deer, Mule Deer, Pronghorn, Buffalo, Elk, Grizzly, Moose, Mountain Goat, Mountain Lion and Wild Boar. Explore the rugged landscapes of Alberta, Canada, Arizona, Maine, Oregon, Tennessee. Take the hunt to the harsh Zambian landscape to track down Lions, Elephants and Kudu. If you need more information please contact the developers of Hunting Unlimited 3 (SCS SOFTWARE), or check out their product website.